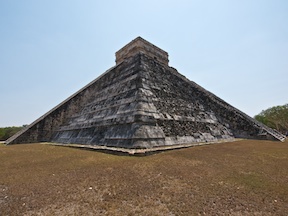 Chichén Itzá hosts an eclectic mix of Toltec and Terminal Classic Maya (Puuc) architectural styles, and is definitely the marquis attraction of the Maya realm. Easily reached by bus or car from either Cancún or Mérida, you’ve got lots of photographic opportunities awaiting you here. A Photographer’s Guide to Chichén Itzá is a comprehensive guide to the ruins, with an eye toward making the photographs you take there the very best they can be. Containing 6 maps, 38 images, and 39 pages of site-specific material (if printed on letter sized paper), this guide costs $4.99. Once you purchase the eBook, write down your password (in Appendix C of the eBook), and head over to the Chichén Itzá supplemental page for downloadable extras. Buy the book for Kindle at Amazon.com (US store, UK store, DE store, FR store), for Apple devices on iTunes / iBooks, for Nook at Barnes & Noble, and for all other devices at Smashwords.